It was assumed for a long time that seals never visited Loch Ness. However, it is now established that they do follow the salmon into the loch on rare occasions. But what about the dolphins and porpoises that are a tourist attraction along the Moray Firth? Is it possible that they could get into Loch Ness? Until now, it was assumed this was a task too great and there was no record of such an event. Indeed, the only possibility was the famous attempt by the Robert Rines team to deploy a couple of equipped dolphins into the loch. This project never saw the light of day when one of the dolphins died. However, some months back, Fortean Investigator, Paul Cropper sent me a clipping which suggested otherwise (Paul is a fan of the Australian Bigfoot called the Yowie). This small paragraph is from the London Daily Mail of the 16th September 1914 (click on all subsequent clippings for sharper images). So we have the incredible sight of not one porpoise but a whole school of them swimming in Loch Ness! I forwarded Paul's find to Adrian Shine at the Loch Ness Centre in Drumnadrochit and he managed to find further details from the local archives. The first clipping from the Highland News of the 5th September tells us more about what was witnessed. So we have eight or nine porpoises in Loch Ness. Now when I pondered on all this and the improbability of it, I wondered if the correspondent had actually seen the Loch Ness Monster in its multi-hump aspect? I mused that if there was a large beast in Loch Ness, it was more probable to see that than a school of porpoises! However, a second clipping from the 19th found by Adrian puts us back in the porpoise camp. This appears to be the original correspondent replying to someone who was incredulous of the whole event. Here we read how the familiar "blowing" activity of porpoises was observed (a habit never reported in monster reports). The article continues to quote an as yet untraced article which speaks of a journalist going out to investigate the matter. Indeed, it seems our witness was as much believed as a modern day Nessie witness as the journalist concluded it was merely a shoal of fish skimming along the surface of the water. So what do we make of this possibly unique event? The first is that so far we only seem to have one person claiming to have seen these animals. 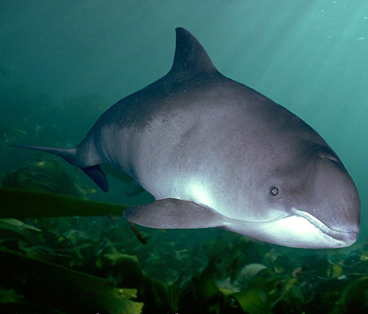 Considering the active surface life of porpoises, one would presume others must have seen them. This muddies the waters somewhat and (according to Adrian Shine) the Inverness Courier does not seem to have run the story. Secondly, could it have been dolphins rather than porpoises? Now, how you can tell the difference between the two from distance is not clear to me but the porpoise has in its favour that they can be half the size of a Bottlenose dolphin and hence could negotiate a river spate into Loch Ness more easily. But whatever the species, it no lessens this remarkable event. Thirdly, it may be asked whether there were any claimed stories about the Loch Ness Monster at that time (as told retrospectively by people after 1933)? There were actually two stories of something seen in 1914, but there were in July and I suspect may have been the same sighting. All in all, it is a strange tale in its own right. Almost 100 years on, the implication is that there is a mass of porpoise skeletons lying at the bottom of Loch Ness somewhere, doubtless covered in silt by now. How did they meet their end? Did they encounter the loch's most famous denizen and will such an event ever be witnessed again? It all adds to the lore and fascination of Scotland's most mysterious loch. Adrian Shine sent me another clipping from the Northern Chronicle for the 16th September 1914 which adds one or two more details to this uniquely recorded event.